For this month’s Beer Blogging Session, Joan Birraire asks us to write about influential beer books. 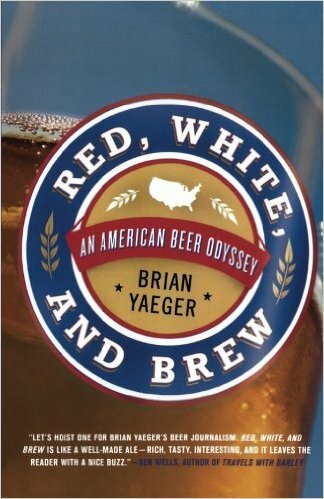 While, I’ve read a fair number of books on beer, one of the most memorable was one of the first I encountered, Red, White and Brew by Brian Yaeger. The book’s premise is simple enough. Brian Yaeger goes on a road trip roughly tracking the perimeter of the United States visiting breweries, talking with the brewers, and sharing the history and stories behind each one. While most of his stops were at small craft breweries like Dogfish Head, Anchor Brewing, and Bell’s Brewery, his travels also took him Yuengling, Leinenkugel and Spoetzl Brewing, which might not be considered craft but had long histories in the United States. Perhaps the most impressive thing about this book is that it was basically Brian’s Master’s thesis at the University of Southern California. That’s right, while most people earn their Master’s degree after long hours in the library or down in some basement lab, Brian got his Master’s driving around and drinking beer. But as you read the book, you’ll realize Brian is a skilled interviewer who writes with an effortless conversational style on beer that’s both informative and entertaining. I read his book in 2008 when I was beginning to discover craft beer. People talk about having their craft beer epiphany. I didn’t have so much of an epiphany, but a fast moving mind expansion on beer over the course of two or three years. It started when I visited a couple breweries. Then I started sampling more and different beers, began posting reviews on RateBeer and it all sort of snowballed from there.It was about a year down that path when I read Brian’s book in 2008 which helped solidify my new found brewing awareness. 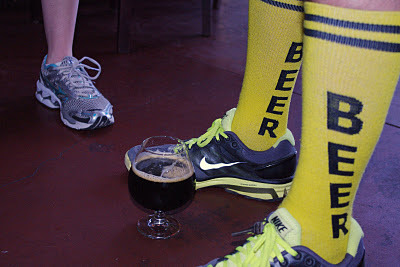 I actually got to know Brian a couple years later organizing three “beer runs” during SF Beer Week from 2010-2012 where we’d regularly attract over a hundred runners who’d all go for a 3-5 mile run and then hang around for a beer or two afterwards at a San Francisco brewery. (Bryan Kolesar was also involved.) For the first beer run, Brian and I communicated totally by e-mail so I never met him until just a few minutes before the start. I was standing outside San Francisco’s Magnolia Pub and Brewery in San Francisco’s Upper Haight neighborhood looking around for him when I see this guy bounding down the street who looked a lot like Yaeger’s photo on the jacket of his book. As he got closer, I noticed he was wearing a green T-shirt from some Japanese brewery, baggy shorts, and these enormous tube socks with “BEER” written on them. There was no doubt it was him. As for the beer runs, we made a unique partnership. Brian admitted to hating running, yet found running down the streets of San Francisco with over a hundred other beer runners exhilarating. I loved running, but was paranoid each year we were going to be arrested or sued for not having the required permits or insurance to hold such an event. It’s amazing the thing lasted as long as three years. Today Red White and Brew comes across as a product of a much earlier time. But how could it not? So much has happened with beer in America over the last eight years. The essential thing I first learned from Yaeger’s book was that every brewery is tied to a place and has it’s own unique story and people behind it. With roughly five times the number of breweries in the US compared to 2008, that’s arguably even more true today than it was back then. And it’s this central feature of Yaeger’s book that drives both my writing and appreciation of beer as I continue to seek out the places, people, and stories behind each brewery. teefury , redbubble , threadless.